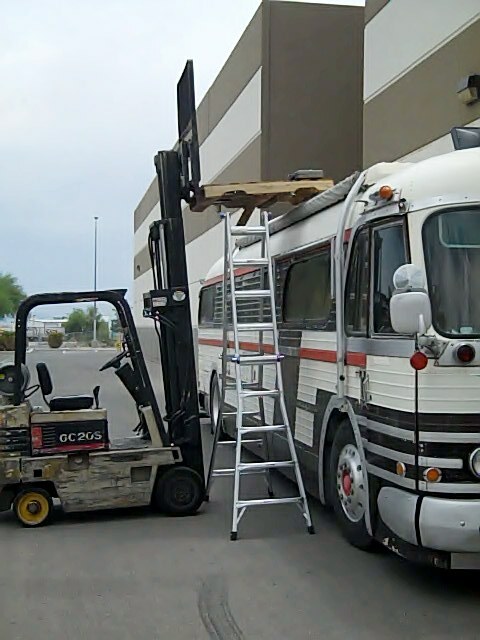 There are lots of things that I like about a bus conversion over a purpose made RV. My budget requires that I own an older vehicle. These old buses were built like tanks. It really is amazing how well they were constructed. On the other hand, they don't have everything that most purpose built RV have. One of those things is a ladder to the roof. I was required to do a little work on the air conditioner and needed a way to get up there. It was an old Coleman and was originally installed in about 1980. That is a long time for any air conditioner to last. In order to access the roof I used a friends fork lift. It made short work of the project. I know that a fork lift will not be available all the time. So I better find a suitable alternative. I have seen various ladder around RV shows but the one that interest me the most is the one that telescopes up an down. The space savings are certainly dramatic with this model. It is called an Xtreme Power Ladder.. As you can see it becomes very compact. Which means that I can store it away.